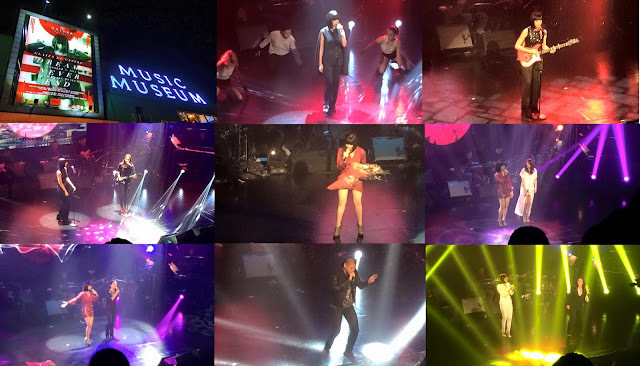 We went to Music Museum last night to witness the concert of Glaiza De Castro entitled Dreams Never End. It's a project that she, her family, her friends have been working on for quite some time now and this is officially her first major concert. Singing is her first love. We've been waiting for this a long time and let me tell you, even for a non concert goer like me, I'd like to say that I really did enjoy what I saw last night. She's got some of her favorite songs, originals that came from her album and a few numbers together with other artists like Kitchie Nadal, Cookie Chua, JayR, Rhian Ramos and Ms. Regine Velasquez Alcasid. I specifically like when she sang Tonight Tonight by Smashing Pumpkins, sort of an homage to alternative and 90's music. I've known Glaiza for quite some time now and have really seen her journey, her hardships and know some of the details on how to put up this concert. It's not as easy as it looks, but overall, her fans loved it, I loved it, her friends and family loved it and she was happy. The performances were great, the guests were all incredible and even some of her friends joined in on the singing part (Say hello to Quark Henares, Gabby Eigenmann and Ketchup Eusebio). Watch out for this Concert as it will be shown on GMA 7 very soon. Here's an interview of Glaiza De Castro right after the show. Try not to tear up if you're a big fan! I'm only a blogger friend to Glaiza, but I sure am really proud of her and what she's accomplished. Please make sure you follow her on Twitter and Instagram if you want to know more about the upcoming shows in Singapore and Canada which I heard will come real soon. Also, don't forget to buy her Gold album SYNTHESIS which is already out on stores and major record bars nationwide! Again, congratulations dear Glaiza! Couldn't be more proud of you!